What the First Lady chooses to wear on her first day in her new role is historically significant. Her inauguration ensemble will be photographed, broadcast around the world, analyzed, and eventually, make its way to the Smithsonian. Melania Trump in Ralph Lauren for the Inauguration. First Ladies often use the occasion to set the tone for their image throughout their term. Jackie Kennedy wore a simple yet chic suit, coat, and pillbox hat designed by Oleg Cassini, who was her preferred designer throughout. Kennedy had already established herself as a fashion icon amid New York’s elite society. As one of the first First Ladies to have a televised inauguration, Kennedy had a keen sense that her fashion choices would drive trends for decades to come (more on that in a minute). Michelle Obama wore a citron-colored Isabel Toledo dress and coat, Nina Ricci cardigan, Jimmy Choo heels, and J.Crew leather gloves to her husband’s first inauguration. That fashion mix—a dress and coat by an American designer, accessories from an accessible-everywhere brand like J.Crew—set the tone for how Michelle Obama would use fashion to support American designers, particularly designers of color, and to present an image of accessibility—of “just like us”-ness. “First ladies traditionally stick to one designer, but Mrs. Obama made a point of wearing clothes from a wide range of young, multi-cultural designers, which sent a message of inclusiveness and great support for the fashion industry”. Michelle Obama in Isabel Toledo in the 2009 Inauguration. While dressing the first lady for her first appearance as a resident of the East Wing is usually a clearcut honor, the latest iteration of this cyclical event has caused more controversy than celebration. Melania Trump’s fashion choices have been divisive since the start of her husband’s campaign. Many designers, loyal to Michelle Obama and the support she had given them, or just opposed to Trump’s platforms, voiced opposition to dressing the incoming First Lady. Controversy aside, what the first lady wears–as Jackie and Michelle and all those before and in between understood—makes history. It sends a message. It is, like it or not, part of history. (The Smithsonian agrees.) 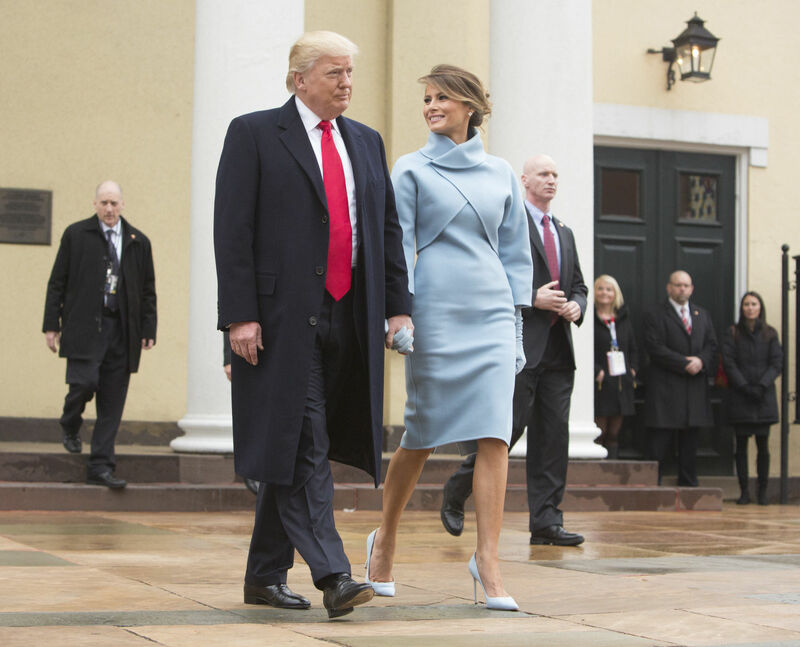 For the inaugural parade today, Melania Trump has chosen to wear a powder blue shift dress, cropped wrap, elbow-length gloves, and matching pumps by Ralph Lauren. Her look takes a very literal page from Jackie O’s inaugural look and overall style. 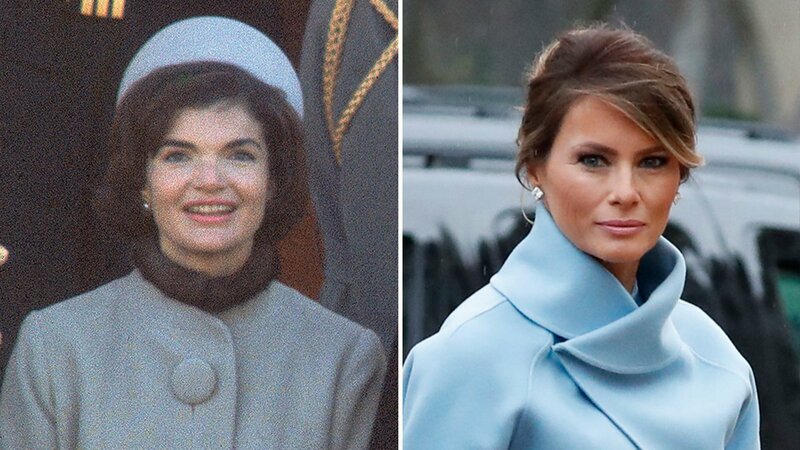 Jackie Kennedy & Melania Trump. What’s the larger significance of this look? That Trump chose an American label is likely no accident—during past campaign appearances she has worn European labels like Gucci, Roksanda Ilinčić, and Dolce & Gabbana, despite her husband’s campaign platform of supporting not just American brands, but products made in America. Of course, Trump’s own fashion line is made in Asia, as is much of his daughter’s. (Though that’s a hard game to win: much of American fashion, including some of Ralph Lauren’s label, is produced in Asia.) Ralph Lauren is also a notable choice considering this was Hillary Clinton’s preferred label throughout her campaign–she wore the designer to accept her nomination at the Democratic National Convention, the presidential debates, her opening campaign rally, and her concession speech. 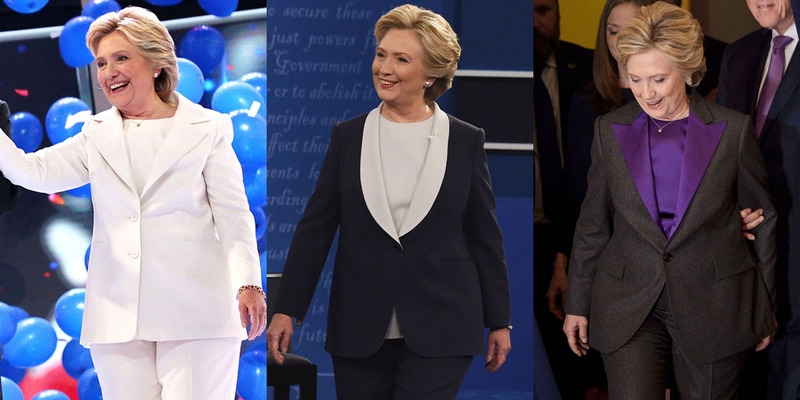 Clinton in Ralph Lauren at the DNC, second presidential debate, and her concession speech. ver the past eight years, Michelle Obama showed us the power, grace, and diplomacy that the first lady can impart through her fashion choices. Fashion was of course not the only industry or world that she impacted—far from it; but it was a realm in which her influence was deeply felt. Will Melania’s impact be as profound? We encounter uniforms everywhere—on soldiers, school children, flight attendants, and fast-food clerks. According to fashion historian Jennifer Craik, the omnipresence of uniforms has “shaped our ways of seeing.” Uniforms are constant reminders of the social order, so commonplace that they are often overlooked. Designed both to blend in and to stand out, uniforms play a unique role in our daily lives. In some ways, they are the antithesis of high fashion. While uniform design focuses on functionality, control, and tradition, fashion design promotes constant change, creativity, and subversion. Yet throughout history, fashion has drawn inspiration from uniforms of all kinds. For example, fashion designers often take functional features and transform them into decorative elements. Uniformity explores the dynamic history behind a variety of uniforms, considering their social role and their influence on high fashion. The exhibition is organized thematically to focus on four categories of uniforms: military, work, school, and sports. 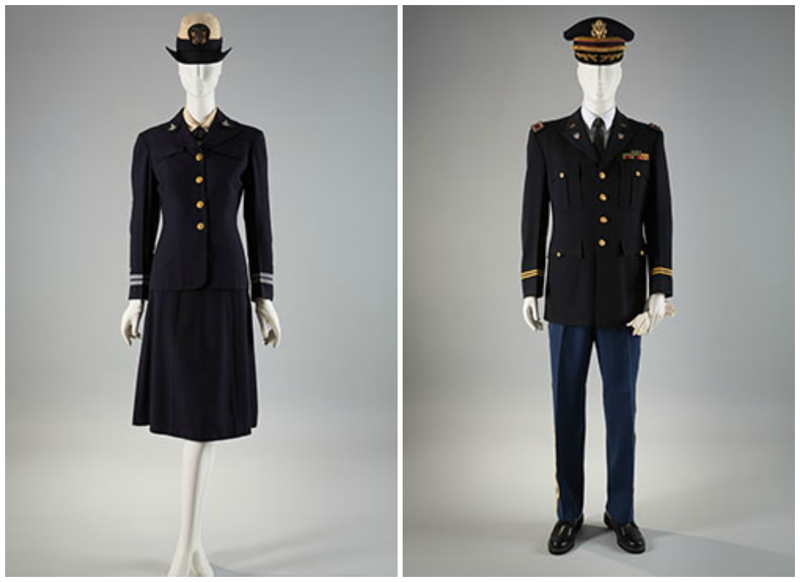 Within each category, historic uniforms are juxtaposed with the high fashion looks they have inspired. Military uniforms are referenced in high fashion more often than any other type of uniform. Designers often borrow elements such as metallic braiding, gold buttons, epaulettes, camouflage, and Breton stripes—features that were originally employed to convey a soldier’s nation, rank, regiment, or branch of the armed forces. The translation of military details into high fashion ornamentation flourished during the nineteenth century. Ornate soutache found its way onto women’s outerwear, and by the end of the century, sailor, or “middy,” collars had become fixtures of women’s daywear. Since then, designers such as Chanel, Claire McCardell, Rei Kawakubo, Jean Paul Gaultier, and Sacai have expanded on the trend by constantly drawing on uniforms in their work. 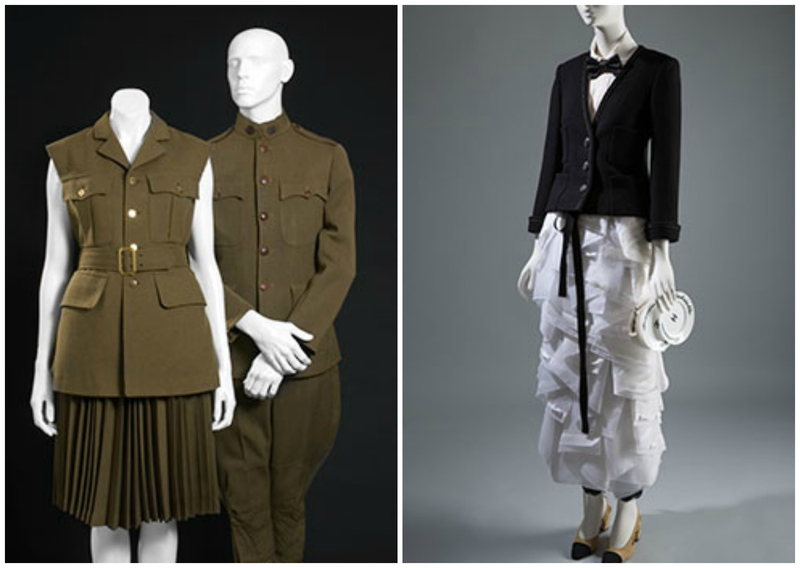 [L to R] Comme des Garçons (Rei Kawakubo), ensemble, 1998, wool; U.S. Army World War I service uniform, 1914-1918, wool, USA. Chanel, “Brasserie Gabrielle” ensemble, fall 2015, wool, silk, cotton, leather, France. To a certain degree, the adoption of military elements for use in (predominantly female) fashion subverts the hyper-masculine authority of the uniform itself. The power and strength of the uniform fuses with the “feminine” fluidity of fashion, resulting in a garment that is transgressive in its dichotomy. It is both at odds with the original uniform and visually similar to it, which creates an intriguing aesthetic tension. 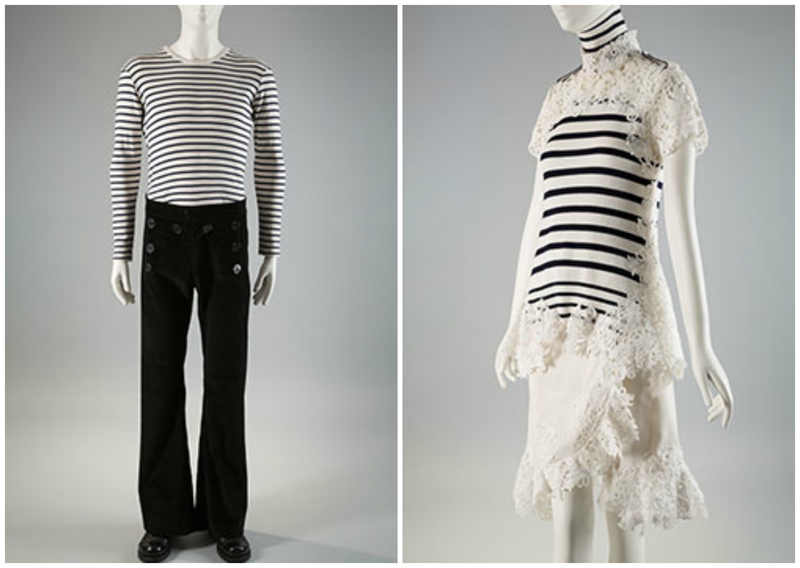 [L to R] Jean Paul Gaultier, ensemble, 1992, cotton, France; Sacai, ensemble, spring 2015, cotton, silk, synthetic. Work uniforms are designed to make employees of different occupations immediately identifiable. To do this, uniform designers utilize easily recognizable devices. Nurse uniforms, for example, have historically included a distinctive cap and bright white aprons or smocks worn over a standardized dress of blue, pink, white, or grey. McDonald’s uniforms, on the other hand, utilize the distinctive colors and symbols of the company logo to transform each employee into an extension of the company’s branding. While work uniforms have not had as much impact as military uniforms, they too have inspired fashion designers. One example of this is a look from Chanel’s fall 2015 collection that plays on the uniforms of Parisian waiters, complete with a clutch bag that mimics the look of plates. 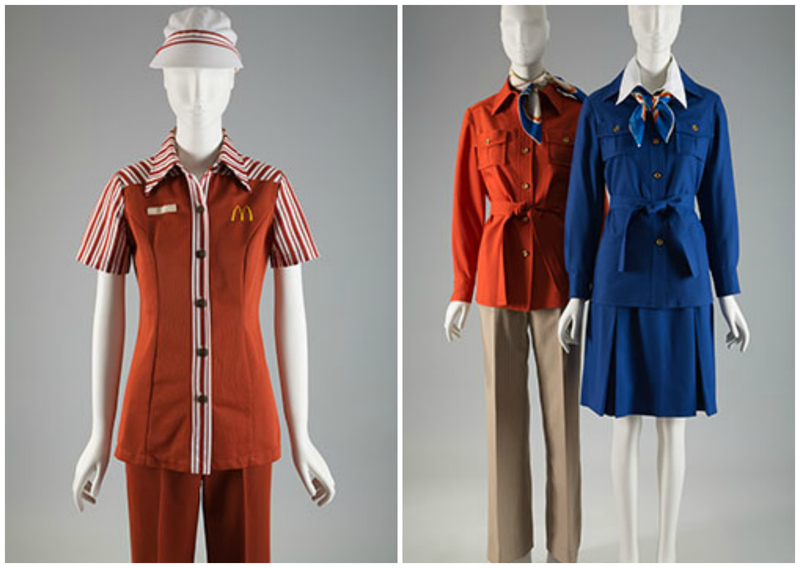 [L to R] Stan Herman, McDonald’s uniform, 1976, polyester, USA. Stan Herman, TWA flight attendant uniforms, 1975, synthetic blend, USA. School uniforms hold a special significance for many wearers. Worn during childhood and adolescence, a school uniform—or more accurately, a person’s reaction to a school uniform—can have a marked impact on that person’s attitude towards dress and even his or her own identity. Many designers have experimented with the signature elements of the school uniform, from blazers to pleated skirts. Thom Browne, for example, often combines the iconography of the school blazer with a traditional grey flannel suit, thus fusing adolescent and adult dress codes in a single look. Likewise, a Rudi Gernreich homage to a schoolgirl uniform from 1967 demonstrates that the style became increasingly sexualized during the second half of the twentieth century. 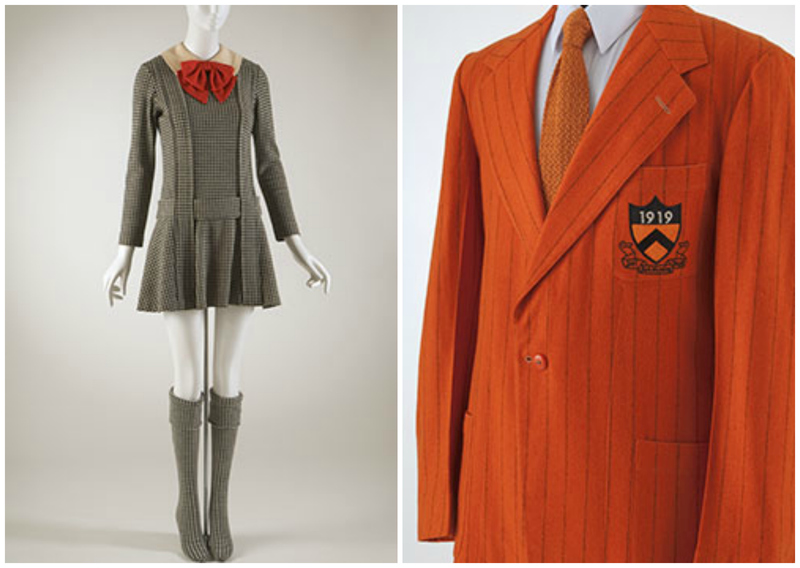 [L to R] Rudi Gernreich, “Japanese Schoolgirl” ensemble, fall 1967, wool, USA. Princeton University blazer, 1944, wool, USA. Athletic uniforms sometimes borrow elements from military uniforms. Color contrasts, bold stripes, and soutache braiding help to convey a sense of power and strength. Athletic jerseys distinguish a team from its competitors, and also unite its members as a cohesive group. However, individual numbers help to maintain a level of individuality within a team. The bold insignias and markings of athletic jerseys have influenced the logo-driven branding of many luxury fashion labels. Companies such as Gucci will often place their company names or logos where a team name, player number, or mascot might appear on the front, back, or even sleeve of an athletic uniform. 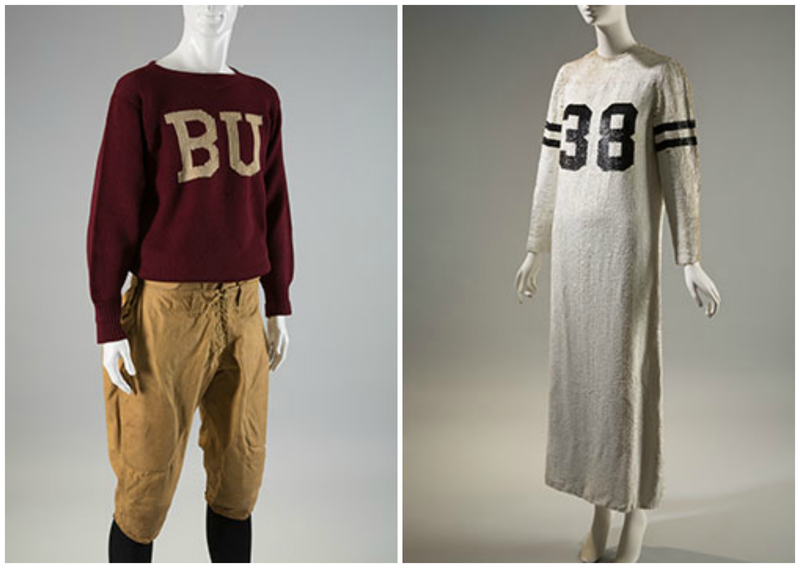 [L to R] Football uniform, c. 1920, wool and cotton duck, USA. Geoffrey Beene, “football jersey” dress, fall 1967, silk and sequins, USA. The push-pull between the identity of a group and that of an individual is a constant tension in modern society. Fashion critic Suzy Menkes once said, “The way that people dress makes them part of an army, dressed in their own uniform, determined to do something.” Although we may not each wear an official uniform in our everyday lives, the influence of uniforms can always be felt, even in the basic activity of getting dressed each morning. Uniformity is organized by Emma McClendon, assistant curator of costume at The Museum at FIT. Baddie Winkle’s life is a Cinderella story. Except substitute the fairy-tale ball gown with punchy neon lips, green hair, club kid sequins and a cigarette; the white mice with 1.7 million Instagram followers (bio: “stealing your man since 1928”); and the carriage with a high-speed jet, transporting her worldwide for appearances and photo shoots, including Paper Magazine and a 12-page spread in Galore. Miley Cyrus has proclaimed her a style icon, and with good reason. 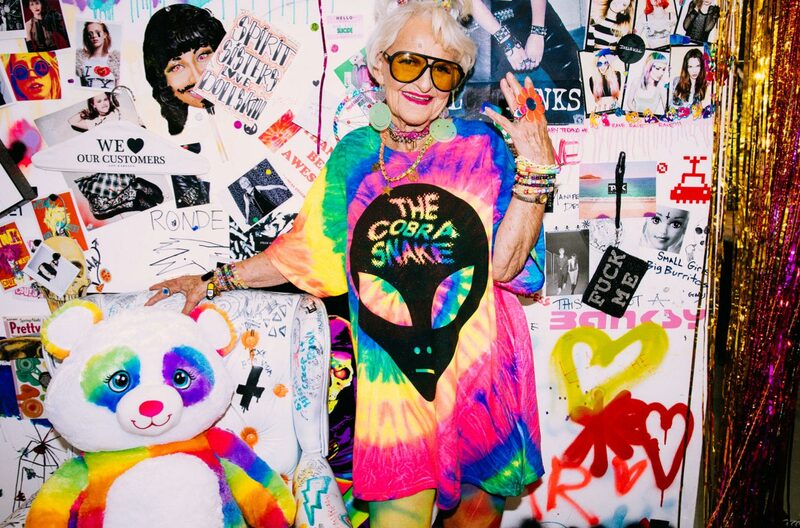 Baddie (née Helen Ruth Van Winkle) is blowing up the fashion world with her audacious, no-holds-barred, age-defying approach to style. “Confidence is everything to me. It is who I am and who I have always been. You have to own your identity and embrace you for you. You have to love yourself no matter what others think of you. It’s all in the way you carry and believe in yourself. “I do love colourful clothes, I don’t wear too much black or anything like that. I love being in LA, because most of the time I’m doing shoots and things, but I also get to have my hair and makeup done and that makes me feel fabulous. “I never take a break or breather. I have never sat down and said ‘Oh I am so old, I can’t do this anymore.’ It has never crossed my mind. I just keep going. People think, ‘I’m 50, I won’t get to model anymore.’ Well, that’s not true. All they have to do is keep on keeping on. “I am embracing who I am even more so in my 80s. I have always been stylish; I just developed a more ‘out there’ attitude. I guess you could say I am living the dream of wearing what I want and not worrying about other people’s impressions. As I say, ‘Live and let live.’ I will wear what makes me feel fabulous and others can wear what makes them feel the same way. What does ‘age appropriate’ really mean? I mean, does it really apply to me or anyone else in this world? My opinion is they need to throw out that term, period. Who am I to judge others on what they wear? I think we only have one judge in this world, and I’d say he is ok with my dressing selections. “I love Miley Cyrus. I think we think alike. I’ve only met her once and talked with her, and she was great. I like her style. I can see where she’s coming from, being younger and always on TV and she had to change herself. She’s a little wild of course, but that’s fine. That’s Miley. I guess I’m a little wild once in a while myself!